Adam got this review to me yesterday, but I messed up and am posting it now. Big thanks to Adam for writing these posts and also big thanks to Aggie Ice Cream for hooking him up with 6 free pints of ice cream to review! So, have I sold the better part of your child's education fund on Utah State University yet? If my previous reviews of Aggie Ice Cream haven't sold you, maybe the idea of getting a virtually unlimited supply of this premium ice cream at the school's dining hall will. Students at Utah State who have access to the meal plan on campus have an opportunity to end (or begin!) each trip to the dining hall with their choice of one of three or four rotating ice cream flavors. And, unlike the pint containers I have in my fridge, these batches are stored at optimal temperature and scooped to your liking with a full toppings bar, making each trip to the dining hall like a trip to your favorite neighborhood ice cream parlor. 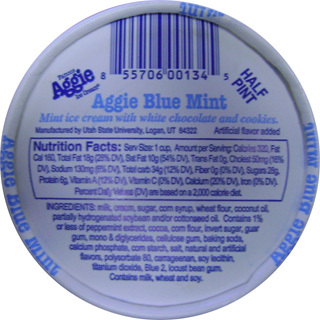 What better way to end our series than with USU's signature ice cream flavor - the ubiquitous Aggie Blue Mint. 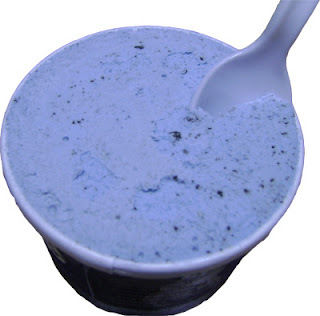 It's not often that you find blue ice cream, and it's even rarer that you find mint flavored blue ice cream brimming with cookies and cream pieces and white chocolate chunks. Typically speaking, I tend to gravitate more towards simplicity when it comes to flavors, but the uniqueness of this flavor alone warrants a try from anyone visiting Utah State. Like all Aggie ice cream flavors, it starts with a dense and creamy base. I like the balance which the half-pint containers strike. There is enough overrun to give the ice cream good body without being rock hard, but not too much that the ice cream doesn't become creamy and richly satisfying after letting it thaw for a minute or two. The mint flavor doesn't strike me as exceptional, but it's balanced and sweet, and about all you could ask for. What separates this flavor is the filling. If mint chocolate chip is classic, than mint and cookies and cream and white chocolate is decadent. The filling in my half-pint doesn't skip on the cookie and cream pieces. They're moist and abundant, and melt in my mouth with the ice cream. The white chocolate chunks - abundant as well - add a great textural contrast and a buttery, albeit artificial taste. Real white chocolate is tough to come by, and judging by the ice creams ingredient list, these pieces are made up of coconut oil, but in this application they work well. Above all, this flavor is ridiculously addictive, and almost makes me feel guilty after eating it (notice how I said, almost). It's ingredient list isn't the cleanest (partially hydrogenated oil makes an appearance) but oh well, a little can't hurt, right? Well, that does it for our reviews of Aggie Ice Cream. Keep in mind I've only covered five of the nearly 30 flavors sold by the company, with all coming in as incredibly fresh and rich. Granted, I may not have eaten at creameries at other universities, but for my money the ice cream in Logan, Utah is second to none.